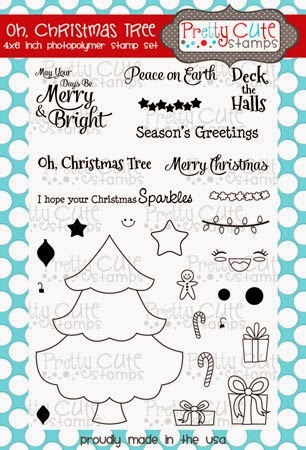 Karla Yungwirth Designs: Pretty Cute Stamps - Oh Christmas Tree! Oh! I was so excited to see the October releases by Pretty Cute Stamps! For my post today for the Pretty Cute Stamps blog I couldn't help but share this adorable set, Oh, Christmas Tree (plus stamps from a few other sets shown below!) There are so many possibilities with this set! So many ways to decorate the tree, and so many wonderful sentiments! 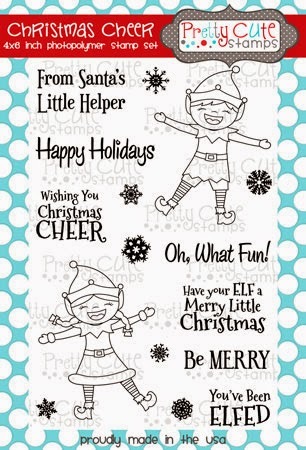 I used some 6x6 ME Christmas themed papers as my background papers and then the fun started! I get so much inspiration from watching my kids craft, and since my 2 year old decided to colour her tree pink - I thought I would colour mine pink too! I stamped the presents and coloured them with gel pens in some non-traditional Christmas colours and popped some up along the bottom with foam dots. I used Prismacolour markers to colour my tree, star and ornaments and then gel pens to colour the garland to look like popcorn. I had to add this happy face - soooo sweet! I used the frame from Any Better Than This stamped with Picked Raspberry Distress Ink on a kraft banner and the snowflakes from Christmas Cheer, which I white heat embossed. I forgot to make sure the ink on the frame was dry before embossing the snowflakes, but I loved how it turned out! The sentiment, Oh Christmas Tree and star garland stamps to the left of the tree are also from the Oh, Christmas Tree set. Inside, I hand cut some matching paper and layered on a piece of white cardstock and a piece of vellum stamped with one of the sentiments from the set, along with a tiny (how cute!) gingerbread man! I had to make a second card, similar to the first, but decorated differently - there were so many ideas of what to do with this set! Take a good look at all the little bits included (below) - amazing! For this card I used Prismacolor Markers again on my tree and gel pens on the garland. I used gold embossing powder to heat emboss the star and ornaments and silver for the little tiny hangers!! I used the frame from the Celebrate Today stamp set around the edge of my banner. On the left side I layered a gold embossed sentiment on vellum and a silver embossed star garland, and popped up the tree banner with foam dots. Inside I used gold embossing powder for the sentiment and silver for the stars on top of vellum and then added some white gel pen stitching lines. These are all the amazing stamp sets I used, available right now at the Pretty Cute Stamps store! Thank you so much for joining me today!! I had so much fun creating these cards, and I can think of a million more ideas for using them! Be sure to check out the Pretty Cute Stamps store to pick up your favourites. Both cards are beautiful Karla love those papers and the stamps are pretty cute!!! Gorgeous results with the kraft card stock. Karla! I love the details of your embossing and layering! 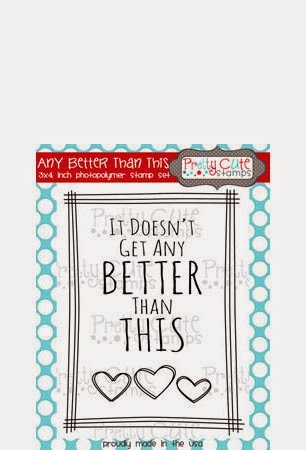 Thanks so much for playing Simon Says Stamp Wednesday “Get Crafty” Challenge! We so appreciate you're sharing your project & creativity at 613 Ave C Karia! I like the happy & non-traditional colors with the tree... such a happy card! ~ginny, DT for 613 Ave Create – Challenge #95 – Anything Goes w/optional Bags, Tags, Boxes & More!